Finished Size: 12×12 inches, Bar Depth: 1.5 in. 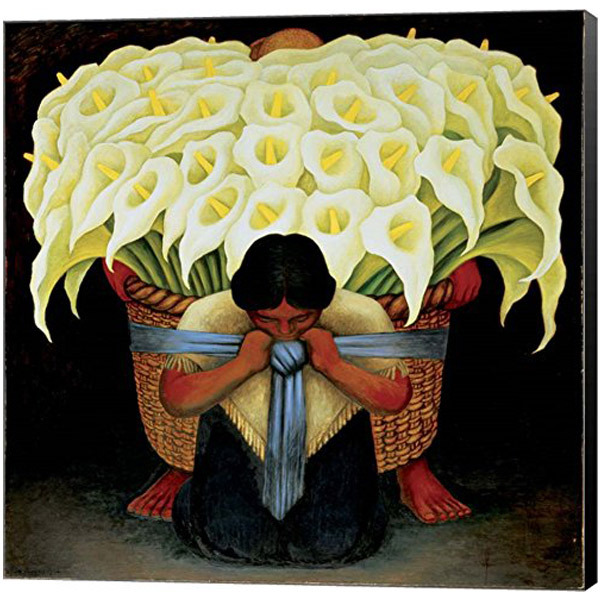 El Vendedor de Alcatraces by Diego Rivera Canvas Art Wall Picture, Museum Wrapped with Black Sides and sold by Great Art Now, size 12×12 inches. This canvas artwork is popular in our Floral Art, Flower Art, People Art, Cultural Art, Mexican Art, Women Art, Lily Art, Calla Lily Art, Hispanic Art, Flower Art by Color, and White Flower Art categories. Great Art Now was started in 2002 by a group of friends with an interest in both art and technology. That interest and a lot of hard work has led us to become one of the largest online retailers in the country. We use our buying power to create great art that can be sold at great prices and is accessible to everyone. All of our artwork is stored in our New Jersey warehouse and our finished pieces are handcrafted for you by our expert craftsman. 4. UVA protective coating will help protect artwork for years to come.